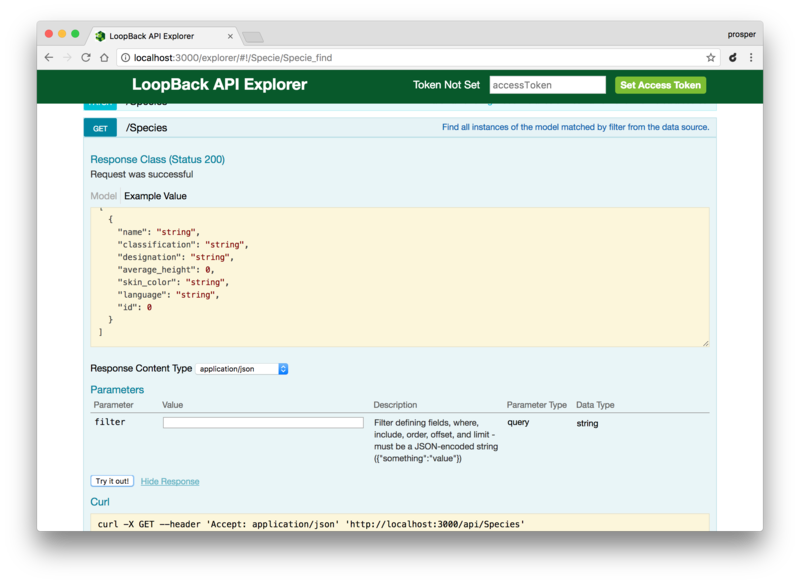 TL;DR: In this tutorial, I'll show you how to leverage Loopback to build out your REST APIs quickly. Check out the repo to get the code. API (Application Programming Interface) endpoints are the connections between your application and the rest of the developer community. 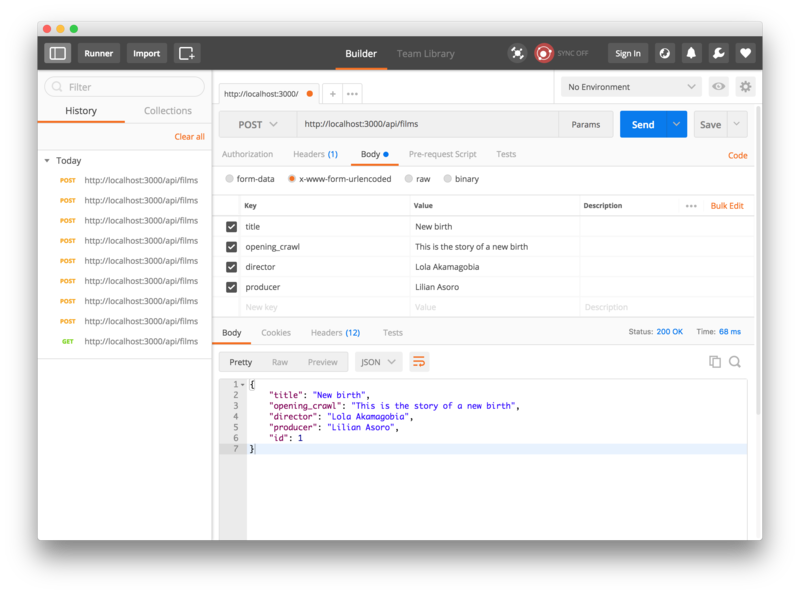 You can decide to open up your data source to the world by crafting API endpoints that developers can consume. 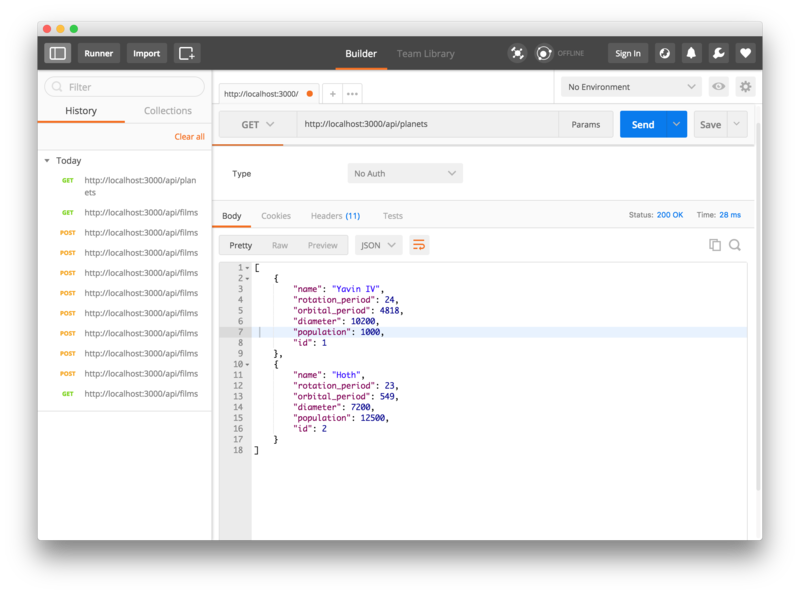 Furthermore, developing an application that will require clients for different platforms such as Desktop, Android, iOS and Windows platform will most likely need a RESTful API for all the clients to access data seamlessly. Unless of course you are engaging GraphQL, the alternate option to RESTful APIs. 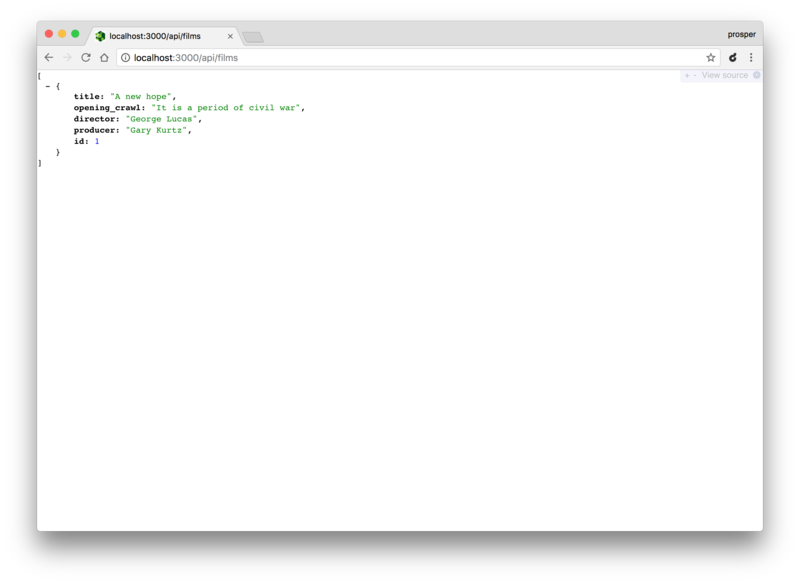 "Loopback is a highly extensible open-source Node.js framework that can be used to build dynamic end-to-end REST APIs"
In this tutorial, we'll build a RESTful API for Star Wars. 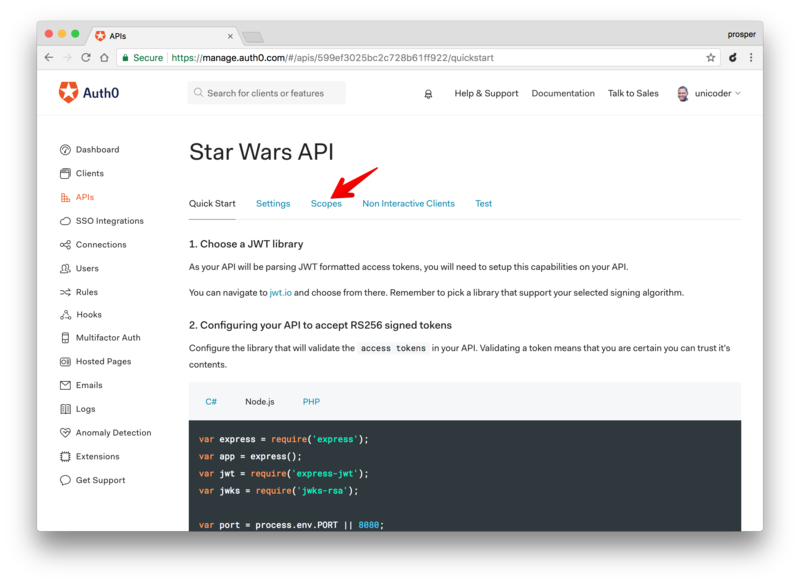 A Star Wars API, SWAPI already exists. 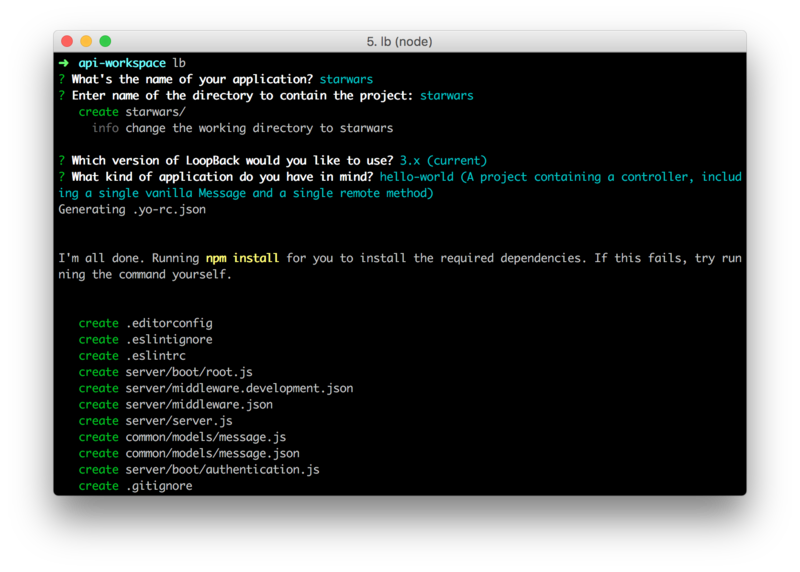 Rather than crafting an entirely different API, we'll build a clone of the Star Wars API. 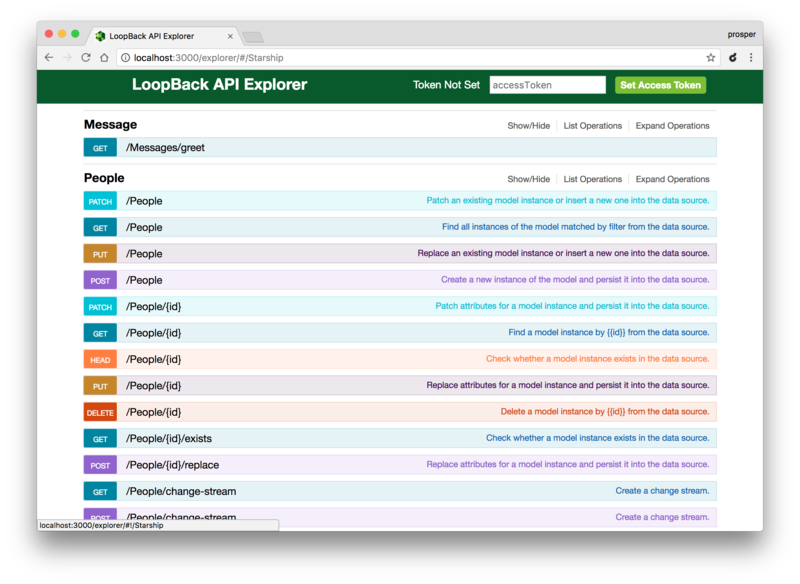 The objective of building the API clone is to learn how to craft APIs quickly with Loopback. Consider a case where you are assigned the task of designing an API for a new interesting HBO show, e.g Game of Thrones, that has caught the attention of Google & Facebook. GET - /vehicles/<id> returns the details of vehicle. GET - /species/<id> returns the details of a specific specie. Next, select common model. 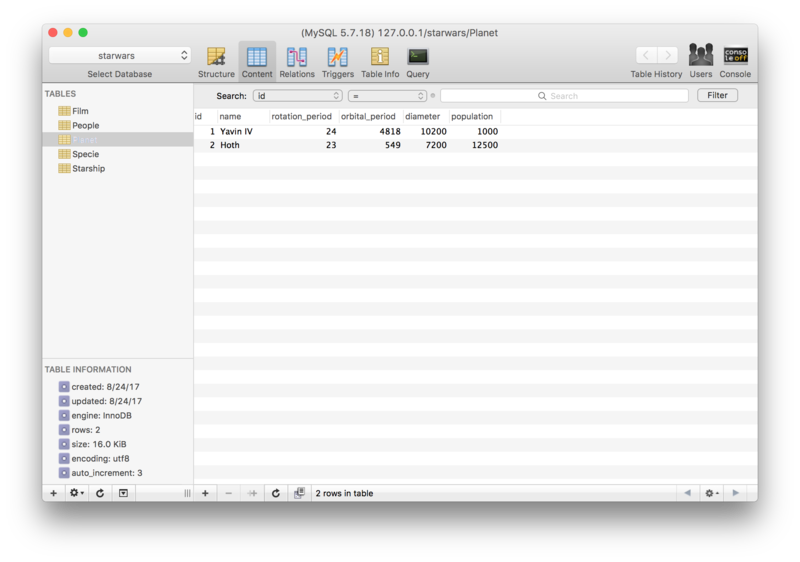 Selecting this ensures that the models are stored in the common directory. You can also decide to store them in the server directory only. The server directory is used to store server-side models while the common directory stores models that can potentially used by both server and client Loopback APIs. The majority of the APIs we use on a daily basis have a means of authorizing users to make changes to them. We'll go ahead and secure some of these API endpoints with JSON Web Tokens. More information about JWTs can be found here. Now, we will make use of Auth0 to issue our JSON Web Tokens. With Auth0, we have to write just a few lines of code to get a solid identity management solution, including single sign-on, user management, support for social identity providers (like Facebook, GitHub, Twitter, etc. ), enterprise (Active Directory, LDAP, SAML, etc. ), and your own database of users. For starters, if you haven't done so yet, this is a good time to sign up for a free Auth0 account. 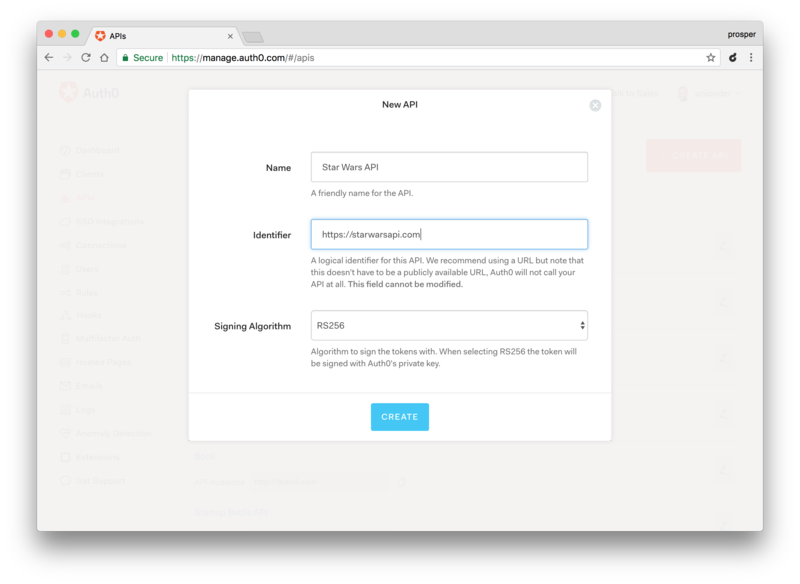 Having an Auth0 account, the first thing that we must do is to create a new API on the dashboard. An API is an entity that represents an external resource, capable of accepting and responding to protected resource requests made by clients. And we are dealing with an API here, SWAPI (Star Wars API). 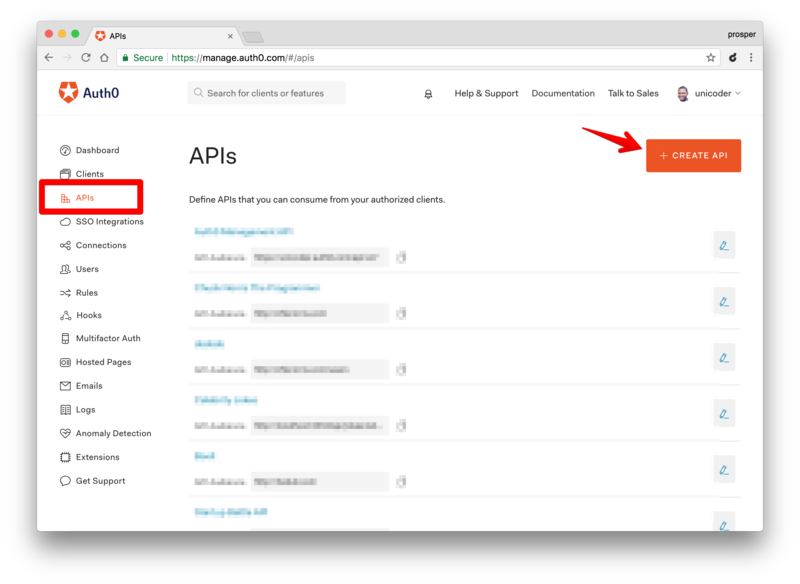 Click on the APIs menu item and then the Create API button. You will need to give your API a name and an identifier. The name can be anything you choose, so make it as descriptive as you want. 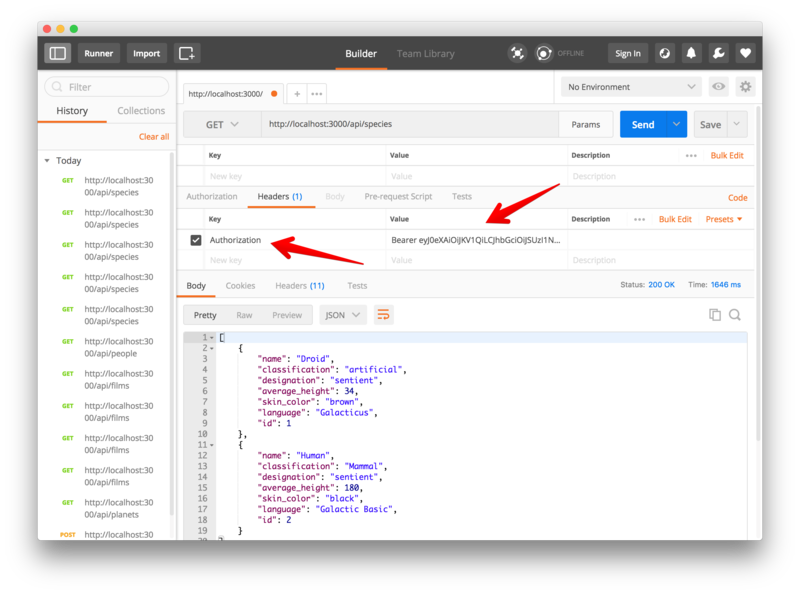 The identifier will be used to identify your API, this field cannot be changed once set. 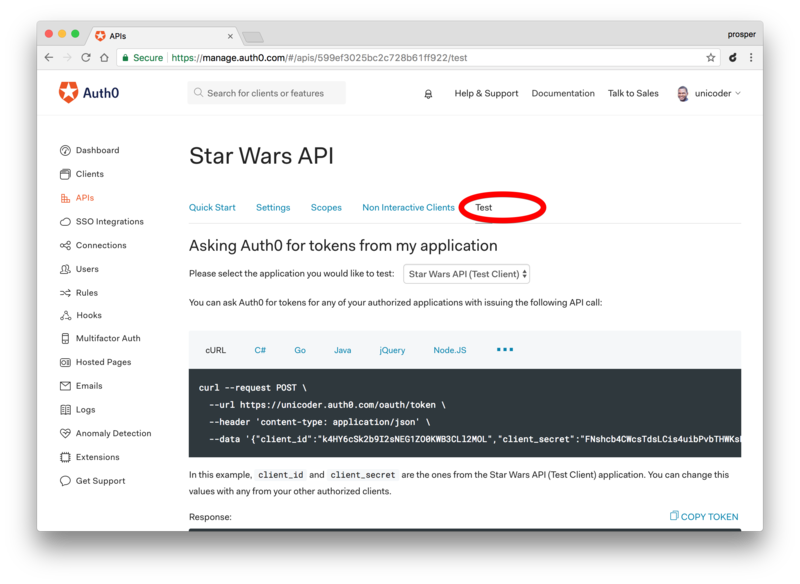 For our example, I'll name the API, Star Wars API, and for the identifier I'll set it as https://starwarsapi.com. We'll leave the signing algorithm as RS256 and click on the Create API button. In the code above, we required express-jwt and jwks-rsa modules. The expres-jwt module is an express middleware that validates a JSON Web Token and set the req.user with the attributes. The jwks-rsa module is a library that helps retrieve RSA public keys from a JSON Web Key Set endpoint. The authCheck variable does the check to validate the access tokens that are sent as Authorization headers. It validates the audience, issuer and algorithm used to sign the token. 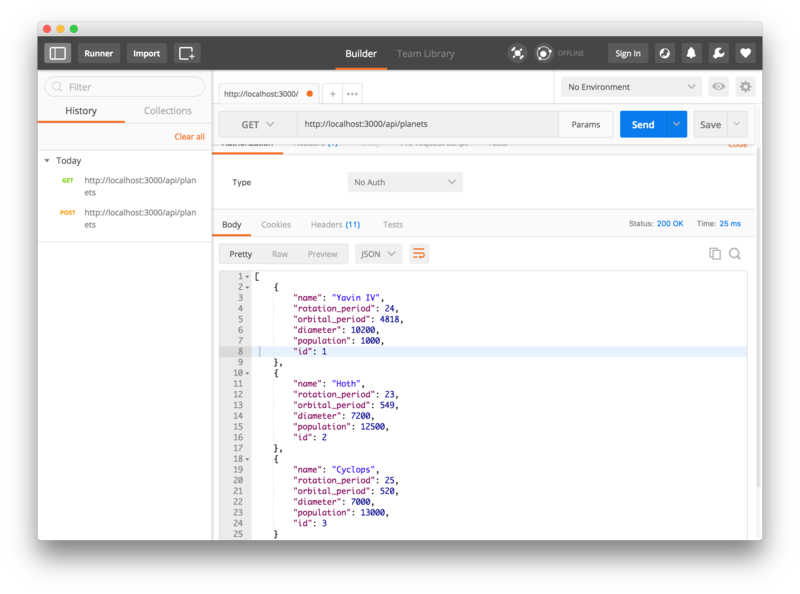 Note: Replace the YOUR-API-AUDIENCE-ATTRIBUTE and YOUR-AUTH0-DOMAIN placeholders with the API audience and Auth0 domain values from your Auth0 dashboard. Here, we used authCheck as a middleware. So, if a user accesses any API endpoint/route without a valid access token or no token at all, it returns an error. Try it out. Now, let's test it with a valid access token. 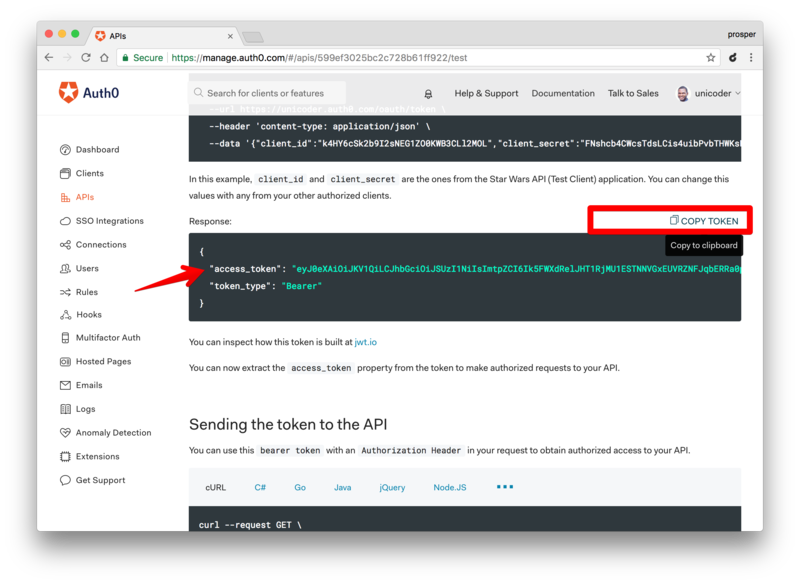 Head over to the test tab of your newly created API on your Auth0 dashboard. 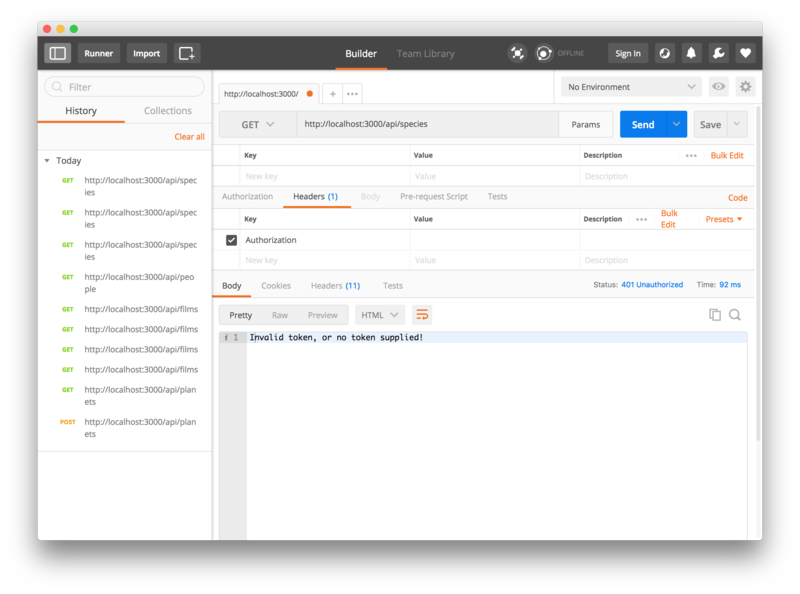 Now use this access token in Postman by sending it as an Authorization header to access api/species endpoint. Aha! It validates the access token and returns the right data. 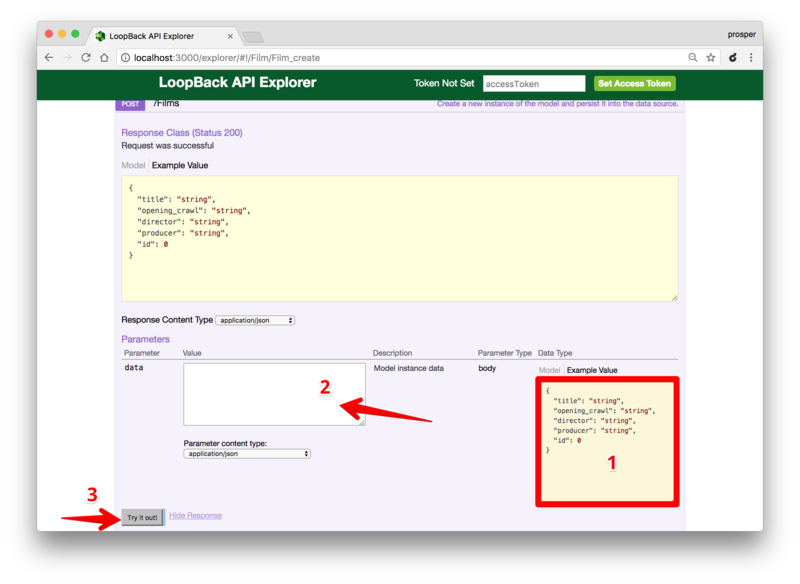 Loopback is a great Node.js framework that can be used to design and build your APIs quickly as shown in this tutorial. It is a project backed up by IBM and the Strongloop team. They are committed to maintaining and improving on this amazing open source project. 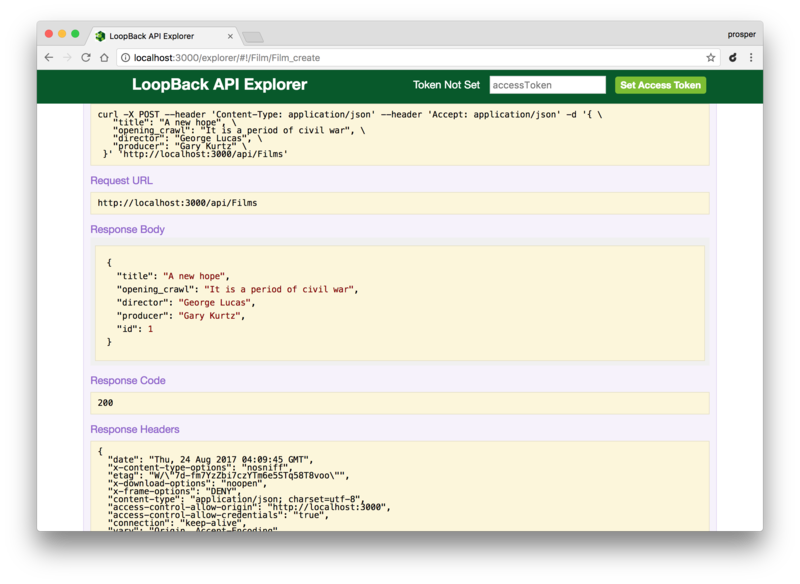 "Loopback is a great Node.js framework that can be used to design and build your APIs quickly"
In addition, Auth0 can help secure your API easily. Auth0 provides more than just username-password authentication. It provides features like multifactor auth, breached password detection, anomaly detection, enterprise federation, single sign on (SSO), and more. Sign up today so you can focus on building features unique to your app.